After logging in securely, members can obtain information about their pension, health eligibility and claims, annuity and employer contributions in seconds. 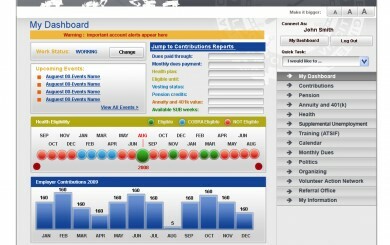 The member dashboard puts answers to 80% of benefits questions at members' fingertips. Charts, graphs and large text communicate key benefits information quickly and easily. Fund staff time use their limited time to address members’ most pressing issues (the web site handles the rest). Funds improve financial performance with improved collections from delinquent employers – this is possible with up to date reporting and other tools. 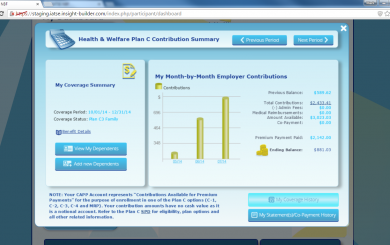 These are designed to educate members about their benefits, these solutions range from straightforward, publicly accessible web sites like www.mlbf.org or www.oe3trustfunds.org that describe benefits, to e-mail newsletter that keep members up to date with changes to their benefits. Secure Informational areas of our clients’ web sites provide members secure access to personal benefit information. Polar Design custom tailors each site to reflect the unique rules and regulations governing eligibility and benefit levels, organizing often disparate data in to a robust, meaningful presentation. 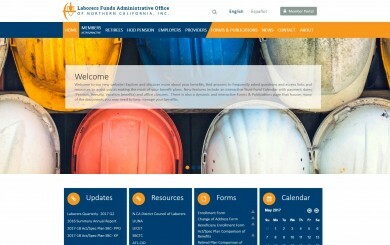 Transactional websites allow members to keep the fund office updated on contact information or beneficiaries, make COBRA or other payments, or make benefits elections. They can also allow employers to remit contribution payments, view amounts outstanding, and other permit the fund office to manage what employers and fund members see. 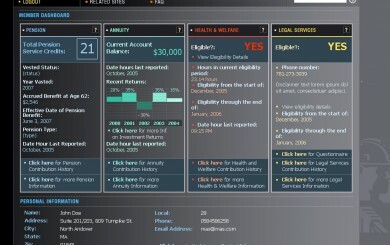 Educational web sites are as simple as interactive “life events” pages that instruct members what steps they should take to retain benefits when key events such as marriage or disability occur in their lives. They can also include multimedia training, whether distributed by DVD or on a web site, that provide members with a better understanding of how their benefits work, or assist with public outreach and member training.